On March 20, 2019, about 1500 eastern daylight time, an Apollo Monsoon, N156AP, weight shift-control special light-sport aircraft was substantially damaged during landing at Rolling Meadows Airfield (29GA), Sharpsburg, Georgia. The private pilot was seriously injured. No flight plan was filed for the personal flight that was conducted under the provisions of Title 14 Code of Federal Regulations Part 91. Visual meteorological conditions prevailed at the time of the accident. The flight departed Atlanta Regional Airport (FFC), Atlanta, Georgia. The pilot was transporting the aircraft back to the his home airfield after undergoing maintenance at FFC. Before landing, the pilot made several low passes over the runway. Shortly after touching down on runway 18, the aircraft veered to the right and impacted trees. Following the accident, a Federal Aviation Administration (FAA) inspector examined the aircraft where it came to rest. The aircraft was on its side, resting against trees to the right of the runway. The fuselage was heavily damaged and was still attached to the wing. The wing was intact with damage to the wingtips. The two-seat aircraft was equipped with a Rotax 912, two-stroke, 101-horsepower engine. The pilot held a private pilot certificate with a rating for airplane single-engine land . His most recent FAA third-class airman medical certificate was issued on August 31, 2017, at that time he reported 250 total flight hours. At 1700, the weather conditions reported at FFC, about 4 miles southeast of 29GA included, wind from 140° at 5 knots, visibility 10 statute miles, clear skies, temperature 17°C, dew point -7°C, and an altimeter setting of 30.12 inches of mercury. SHARPSBURG, Georgia — One person is in the hospital after a weight-shift-control trike crashed in Coweta County. 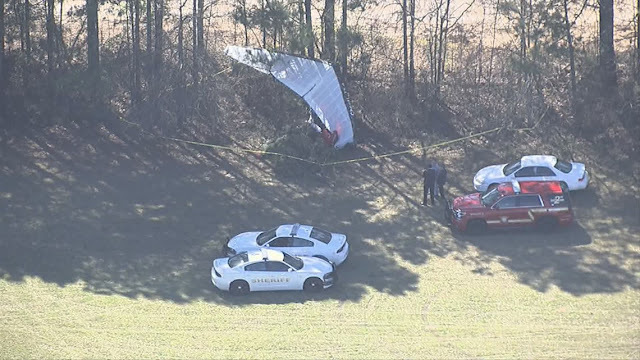 According to the Coweta County Sheriff's Office, the crash happened near a private airstrip at the Rolling Meadows Airfield in Sharpsburg. The 11Alive Skytracker flew over the wreckage site where you can see the weight-shift-control trike near a line of trees. Federal Aviation Administration spokesperson Kathleen Bergen said the agency is investigating the crash and identified the weight-shift-control trike as an Apollo Aircraft Monsoon. Bergen described it as a "light sport aircraft."